Okur practiced with the Nets for the first time today as the team worked together for the last time before it opens the season Monday night in Washington against the Wizards. He arrived in New Jersey around 1 a.m. today, after being traded to the Nets on Thursday night for a second-round pick in 2015. Coach Avery Johnson said it will probably take Okur “a week or two to get in sync with what we’re doing.” But as the coach pointed out, the Nets don’t have that kind of time — not only do they go live Monday against John Wall and the Wizards, but they open the season with six games in eight nights, which means no practice time for Okur to learn the Nets’ offense. Fortunately, Okur has some familiarity with some teammates, at least. 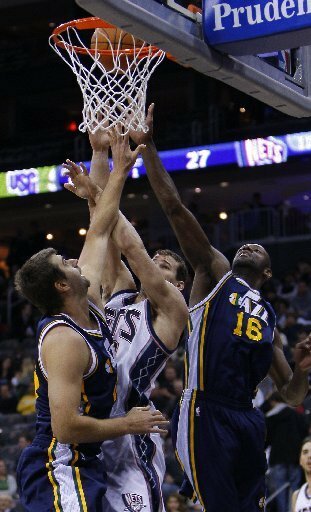 He played with Williams in Utah for more than five seasons, and also played with Sundiata Gaines with the Jazz. Okur was acquired to help fill the void left by Brook Lopez, who had surgery Friday to repair a stress fracture in his right foot suffered in Wednesday’s exhibition game against the Knicks. The team estimated Lopez would be out six to eight weeks. Okur himself is coming off an injury-plagued season in 2010-11, where he was plagued by back problems caused by a too-early return from a ruptured Achilles. He was limited to just 13 games, and averaged 4.9 points. But he said he is healthy now, and doesn’t see any reason why he can’t bounce back and be the 17.6-ppg player he was when he was an All-Star in 2006-07.